This is a dinosaur book with a difference. Join world-renowned paleontologist Dr. Kenneth Lacovara on a remarkable journey––back to when dinosaurs roamed the Earth––to discover fundamental truths about our own humanity. Lacovara reveals dinosaurs to be widespread, persistent, and innovative creatures that achieved feats unparalleled by any other species. Yet dinosaurs remain mysterious and misunderstood. What can long-dead dinosaurs teach us about our future? Plenty, according to paleontologist Kenneth Lacovara, who has discovered some of the largest creatures to ever walk the Earth. By tapping into the ubiquitous wonder that dinosaurs inspire, Lacovara weaves together the stories of our geological awakening, of humanity’s epic struggle to understand the nature of deep time, the meaning of fossils, and our own place on the vast and bountiful tree of life. Go on a journey––back to when dinosaurs ruled the Earth––to discover how dinosaurs achieved feats unparalleled by any other group of animals. Learn the secrets of how paleontologists find fossils, and explore quirky, but profound questions, such as: Is a penguin a dinosaur? and, How are the tiny arms of T. rex the key to its power and ferocity? As we move into an uncertain environmental future, it has never been more important to understand the past. "This is a dinosaur book with a difference. In lyrical prose Kenneth Lacovara shows how an understanding of the past helps to understand the present." "Kenneth Lacovara LOVES Dinosaurs, LOVES science and truly LOVES telling you about it. Few nonfiction writers wield words with more poetic and potent affection for their subject." "Majestic, awe-inspiring--and deeply humbling. 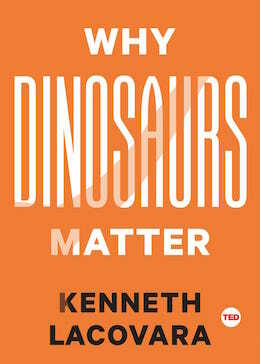 Kenneth Lacovara reveals how dinosaurs have changed how we understand time, the world, and ourselves." "This is a great book." Listen to Lacovara on Science Friday : Why Do Dinosaurs Matter? Read an original essay by Lacovara on Powell's Books : Does Oil Come From Dinosaurs? Kenneth Lacovara has unearthed some of the largest dinosaurs ever to walk our planet, including the super-massive Dreadnoughtus, which at 65 tons weighs more than seven T. rex. Through his work, blending exploration with the latest techniques from medicine and engineering, Lacovara portrays dinosaurs as vigorous, competent creatures—the adaptable champions of an age. Lacovara is sought around the world for his ability to bring the wonders of science and the thrill of discovery to a wide range of audiences. “He’s got a way of illuminating the bigger picture, of somehow turning ‘why’ into wonder. It’s not just that he’s speaking about what happened way back when, but what it might mean for us today.” Says Chris Anderson, Curator of TED. He has appeared in many television documentaries and his discoveries have landed him three times in Discover magazine’s 100 Top Science Stories of the year and in Time’s Top Stories of 2014. Lacovara was named by Men’s Journal as one of “The Next Generation of Explorers” and he is an elected fellow of the prestigious Explorers Club in New York. Kenneth Lacovara is the founder and director of the Edelman Fossil Park of Rowan University in New Jersey.